LAURA WILLIAMS MCCAFFREY is a full time writer and teacher of writing. Her short story "Into the Vast" was published by YA Review Network, and she has a short story forthcoming in Soundings Review. Her third novel, a dystopic fantasy for teens, will be released by Clarion Books. She’s the author of two children’s fantasy novels, Water Shaper (Clarion Books) and Alia Waking (Clarion Books). Water Shaper was selected for the New York Public Library Books for the Teen Age 2007 list. Alia Waking was named an International Reading Association Notable Book. It was also a nominee for the annual Teens’ Top Ten Books list and for Vermont's Dorothy Canfield Fisher Award. 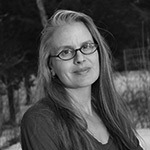 Laura is on the faculty at the Solstice low-residency MFA in Creative Writing Program at Pine Manor College. She lives in a small house in the woods with her husband, regionally acclaimed musician Colin McCaffrey, and their daughters. For more information about her or her work, visit her website at: www.laurawilliamsmccaffrey.com.